Netflix Increases Subscription Prices As It Churns Out Original Content The hikes, which will affect all U.S. viewers, come as Netflix faces an increasingly competitive field of video streaming services. 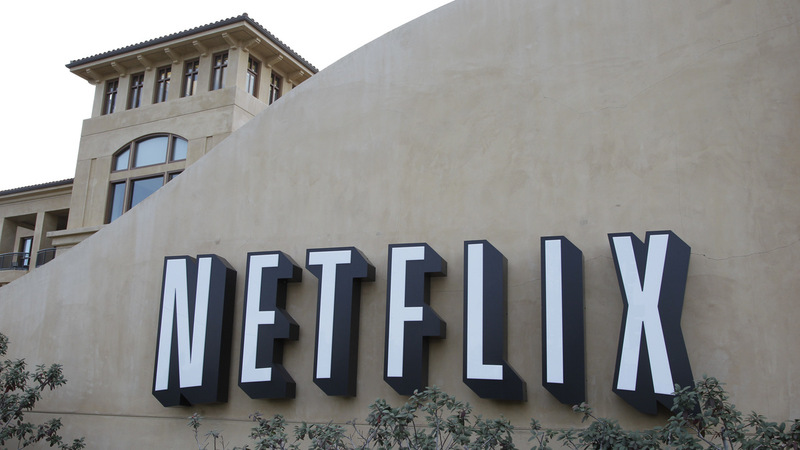 Netflix has increased its prices by 13 to 18 percent. The company's headquarters are pictured here in Los Gatos, Calif., in 2012. The company's most popular subscription plan, which allows high-definition viewing on two screens, has jumped from $10.99 to $12.99 per month. Its cheapest, non-HD plan has risen from $7.99 to $8.99, and its premium plan from $13.99 to $15.99. It's the largest hike since the company launched its video streaming service 12 years ago, according to The Associated Press. The increase has drawn a positive response from Wall Street, where Netflix's stock increased 6.5 percent on Tuesday. The increase will affect all consumers in the United States, the company tells NPR in a statement, as well as countries in Latin America and the Caribbean where Netflix bills in U.S. dollars, including Uruguay, Barbados and Belize. In the U.S. alone, Netflix has 58 million subscribers. "We change pricing from time to time as we continue investing in great entertainment and improving the overall Netflix experience for the benefit of our members," Netflix tells NPR. Still the dominant player in streaming and subscription video on demand, Netflix has felt pressure from current rivals like Amazon and Hulu, as well as new competition set to enter the market, including Disney, NBC and Apple. Part of the company's strategy to deal with increased competition has been to put money into original content, which it has been producing since House of Cards hit the small screen in 2013. Michael Pachter, a media analyst at Wedbush Securities, told NPR last month that Netflix's goal is "to be a major production company that makes compelling content that is available exclusively on Netflix." In a rare move that illustrates the company's production ambitions, Netflix recently showed an original picture in theaters for several weeks before making it available online. The cinematic, black-and-white film Roma may even be an Oscar contender, NPR's Jasmine Gard reports. And it's already won several critics' choice awards. Netflix also won an Academy Award last year, for its documentary Icarus about doping among cyclists. Netflix has also reached into its pockets for other content that attracts viewers, including the late 90's and early 2000's sitcom Friends. The company is paying $100 million to keep licensing the popular program for 2019, up from $30 million, The New York Times reported in December. Increased subscription revenue will likely help balance the books over the next several years, the AP reports, as long as Netflix's total user base of 165 million people continues to grow. Anyone new to the streaming service will immediately be charged the higher prices, while the increases will roll out to existing customers over the next few months. Netflix will notify existing members by email 30 days before raising the cost of their subscription.